Lake Fork is located in Texas, and is one of the premier trophy bass fishing lakes in the southern USA. The bass fishery on Lake Fork is phenomenal, yielding 15 of the top 20 Texas State Record Largemouth Bass. The lake was impounded in 1980, and reached its normal pool surface elevation of 403.0 feet (123 m) above mean sea level in 1985. It covers 27,690 acres (112 km²), and is situated within Wood and Rains County in Northeast Texas. Major towns in the Lake Fork area include Quitman, Alba, Emory, and Yantis, Texas. It offers 315 miles (507 km) of shoreline, and has a drainage area of 493 square miles (1,277 km²). The dam is 12,410 feet (3,783 m) in length and impounds Lake Fork Creek, a tributary of the Sabine River. Other major creeks of the Lake Fork drainage basin include Big Caney and Little Caney creek. Lake Fork was created as a textbook fishery, including initial stockings before the lake filled. Lake Fork was established, by the Texas Parks and Wildlife, primarily as a bass fishing lake, with implantings of 730,000 Florida Black Bass, stocked between 1979 through to 1987. Lake Fork offers excellent fish habitat with 80% of the standing timber left intact, and abundant vegetation, predominantly hydrilla, milfoil, and duckweed. With such a rich diversity of bass holding structure and a healthy population of forage, which includes shad, minnows and crawfish, Lake Fork bass are very prolific. Bass tactics generally include flipping jig n pigs into timber, and dipping large plastic worms and lizards into the weedbeds. 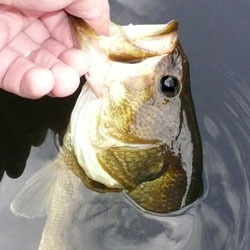 Casting crankbaits which imitate wounded shad in the creek channels are also very effective, especially in the spring. Other species of fish include Catfish, Black and White Crappie, Sunfish, and Bluegill. For Crappie, try tightlining or trolling tube jigs around main channel and creek channel flats or fishing shorline timber. To preserve the Lake Fork bass fisheries, there is a slot limit enforced on the lake, with no possession of any bass between 16 and 24 inches. All bass within the slot size must be released immediately. 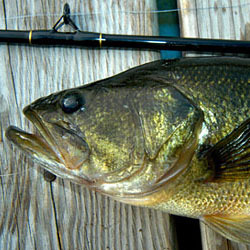 A 5 bass per day limit is imposed, with no more than 1 fish kept over 24 inches (609 mm), and 4 under 16 inches (406 mm). Regarded as the best bass lake in Texas and one of the top in the U.S. 36 of the largest bass in Texas came from this lake. There are good crappie here too. 27,690 acres. Each detailed map provides depth, contours, structure, boat ramps, and updated fishing information. Lake Fork fishing maps also include lake info such as gamefish abundance, forage base, water clarity, weedline depth, bottom composition, complete latitude/longitude grid lines and dozens of GPS waypoints & coordinates.